MLive.com: Michigan Wolverines Football News app gives Wolverines fans exclusive access to the latest news, videos and photo slideshows from MLive.com. Read exclusive articles about the Wolverines and other rival teams, catch live Twitter updates from fans and experts, view and submit photos from the game. 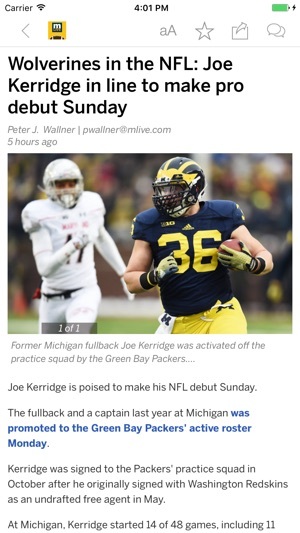 Download the MLive.com: Michigan Wolverines Football News app today! Not sure where to put this review, so here it will be. I've always loved this app, still do, but the writers have such terrible grammar and spelling. It's every article. Simple stuff, such as using the correct 'their,' or spelling it correctly for that matter. Players names, etc. It really detracts from the content when you are reading articles that look as if a middle schooler wrote them. Other than that, this app is golden and works fantastic. It's just the grammar and spelling. It's amazing how hard these guys work. You get all of the season's stories, strategies, accomplishments, criticisms, scores, predictions, game summaries and news conferences. After the season, you get the camps, the recruiting and all the stories. I check it everyday the entire year. Go blue! This used to be a good app, with just articles and information about Michigan football. But can’t give it more than 2 stars now because now it’s clogged up with a bunch of articles about other sports. Please go back to football related articles only. That’s why the app was called UM Football. Create a different app if you want to cover other sports at U of M.